“It’s a great day to be a Deacon!” senior Luke Dellorso said as he filmed freshmen as they moved into their residence halls during move-in day Aug. 26. Dellorso, who seemed about as excited as the freshmen that a new year was beginning, was filming for the Traditions Council, a student group dedicated to preserving Wake Forest’s traditions and heritage. 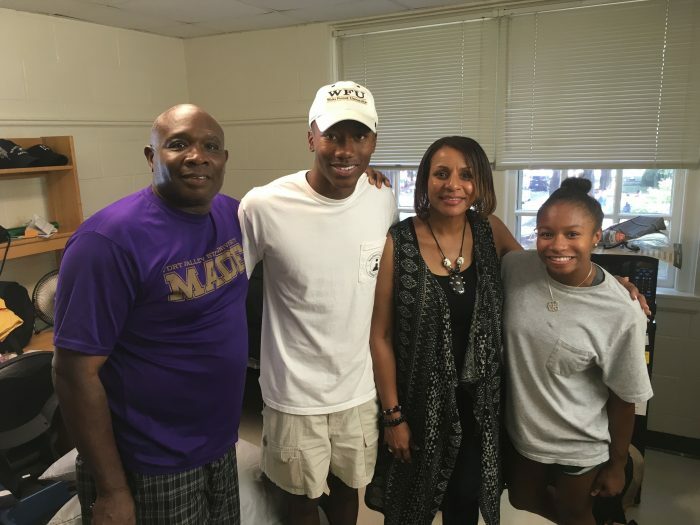 For alumni parents, move-in day was an especially great day to be a Deacon. 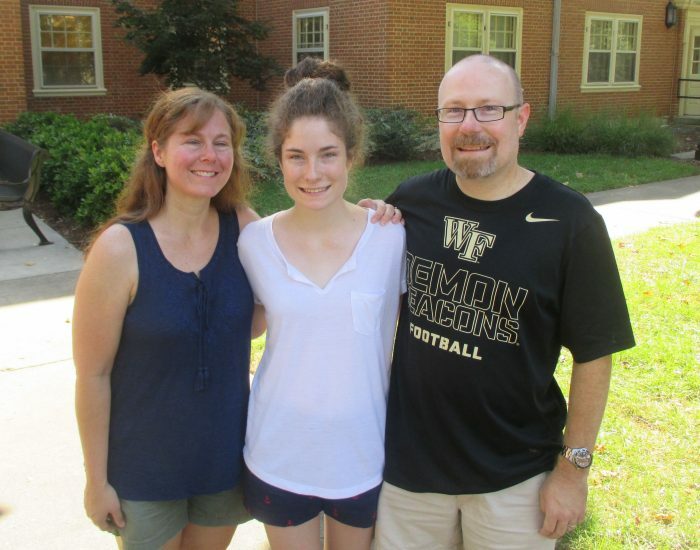 For their children — who’ve grown up listening to their parents’ stories — it was finally their turn to start marking their own Wake Forest memories. 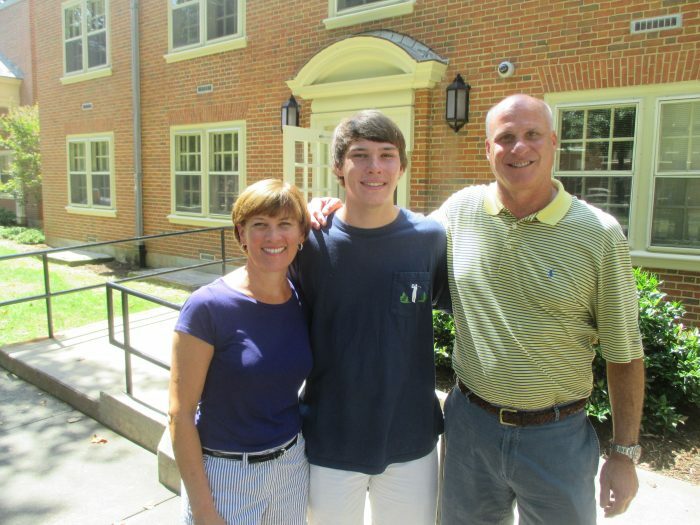 Annette Gray Ferrell ('84) and Scott Ferrell ('84) from Greenville, South Carolina, with their son, Gray. Nearly 1,300 first-year students from 45 states and 24 countries moved onto campus this week. Some arrived early for half a dozen pre-orientation programs that included volunteer service opportunities, a wilderness adventure, a Campus Ministry retreat and Deacon Camp, an introduction into Wake Forest’s history and traditions. But most moved in on the official move-in day under bright sunny skies with blistering temperatures that soared into the 90s by lunchtime. As cars pulled up in front of South Campus dorms, an army of helpers waited to unload each car. Student-athletes, coaches, members of the dance team and facilities staff hauled storage containers, colorful comforters, boxes, televisions, guitars and pictures into the six residence halls on South Campus. “This is our Super Bowl,” said Donna McGalliard, dean of Residence Life and Housing. Clay (’88) and Connie Lindsay with their daughter, Ann Fisher Lindsay. Clay (’88) and Connie Lindsay from Salisbury, North Carolina, surveyed the pile of clothes and storage containers — spread out on the grass between Johnson and Bostwick dorms — that their daughter, Ann Fisher Lindsay, brought with her. Kaleb Bryant with his parents, Kita and Sherman, and sister Kyla. 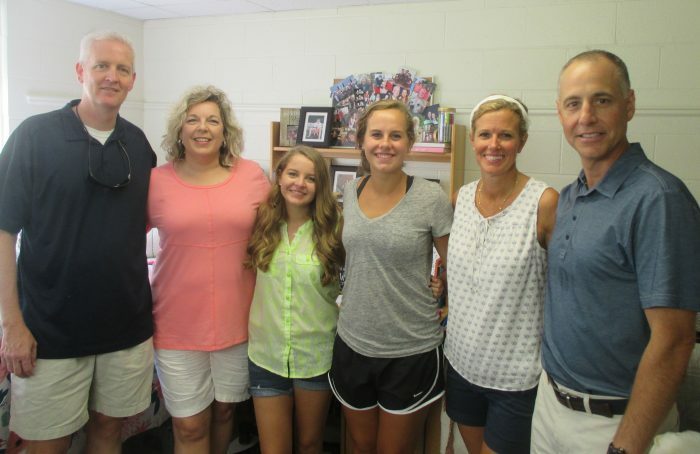 Move-in day was the start of five days of academic and social events for freshmen. Students will meet with their academic advisors, learn about volunteer opportunities and Wake Forest traditions and even get a “Taste of Winston-Salem” from local restaurants. Classes begin Aug. 30. Alumni with children in the Class of 2020 largely graduated in the late 1980s and 1990s. Men lived in the Quad dormitories, women on the “women’s side” of campus, now called South Campus. They went to the “snake pit” in Reynolda Hall, checked their mailboxes in Poteat Residence Hall and got lost in Tribble Hall (some things never change). The Benson Center, Olin Physical Laboratory and the Wilson Wing of the Z. Smith Reynolds Library were brand new or under construction. There was no Greene Hall, Farrell Hall or Miller Center. Matt Crawford with his mother, Sara Sitton Crawford ('90) and his grandparents, Carroll and Larry ('61, JD '64) Sitton. 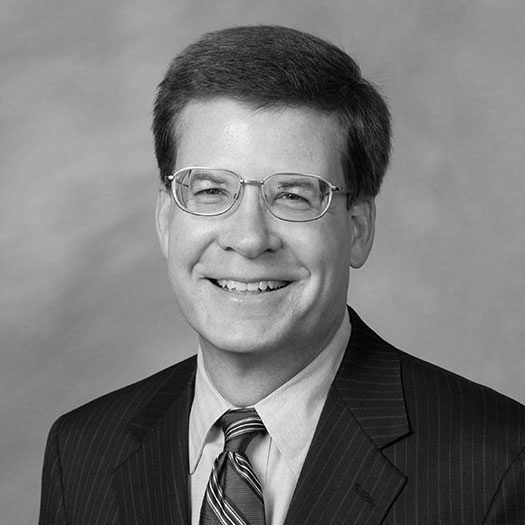 Wake Forest has changed even more since Larry Sitton (’61, JD ’64) enrolled in 1957, just a year after the move to the “new” campus in Winston-Salem. 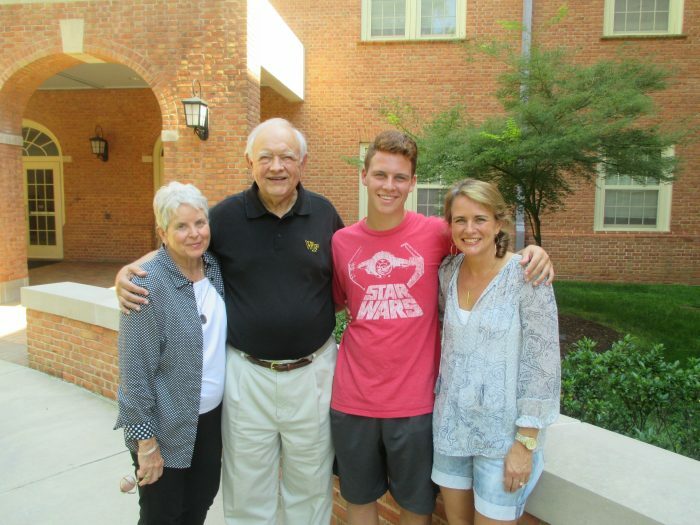 In 1986, Sitton brought his daughter, Sara Sitton Crawford (’90) to Wake Forest for her freshman year. This year, Crawford and her husband, Matt (’88, MBA ’00), from Austin, Texas, brought their son Matt to campus for his freshman year, keeping the family tradition alive. “Fifty-nine years ago,” Larry Sitton laughed as he tried to remember his freshman year, “that puts things in perspective.” Students couldn’t dance on campus back then, he said, as he remembered the 1957 dance protest when students defied authority and did the bunnyhop on the Quad. “Your grandson can dance anytime now,” Sara Crawford laughed. Lisa Holland Blumenfeld ('92) and Chris Blumenfeld ('94) from Fort Mill, South Carolina, with their daughter, Emily. 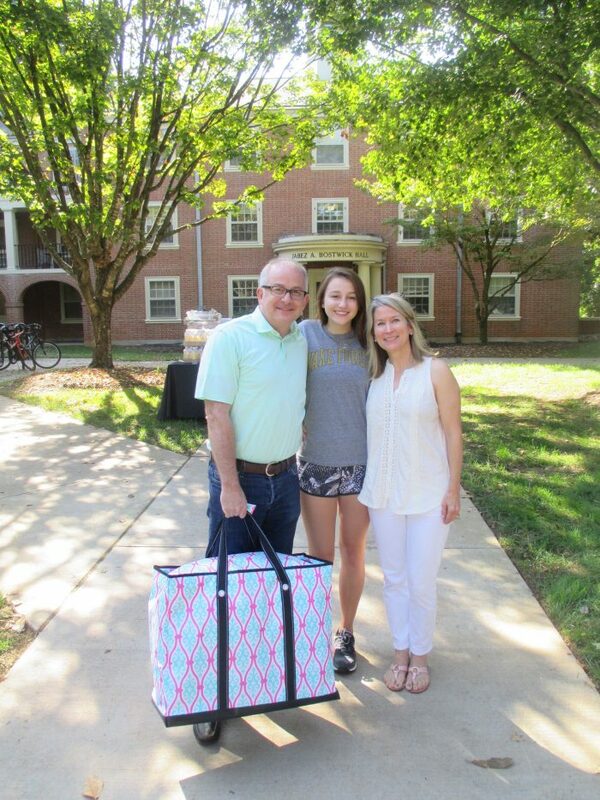 Kevin Laws (’89) and Heather Scull Howland (’90) graduated from Wake Forest one year apart but never met each other until they moved their daughters into the same room in Babcock Residence Hall. But their daughters, Katherine and Maisie, were becoming fast friends. Kevin ('89), Kippi and Katherine Laws with Maisie, Heather ('90) and Scott Howland. 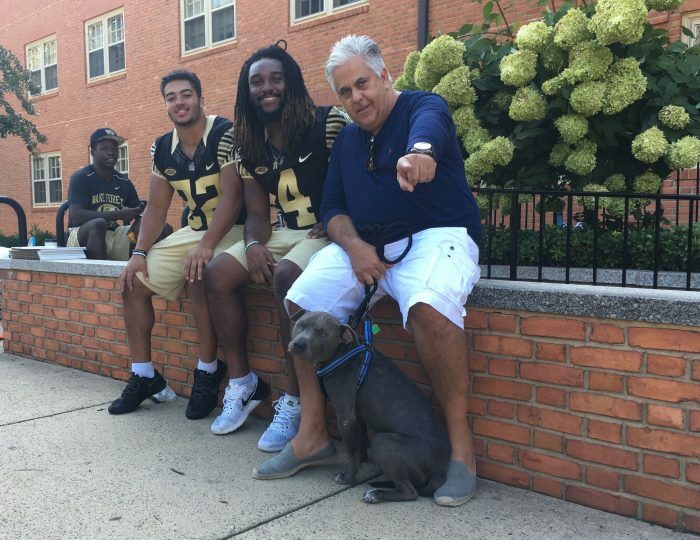 Tino Grana from New York City, father of freshman Isabella, waits outside his daughter's dorm with Gummy the dog and Deacon running backs Matt Colburn and Rocky Reid, who helped with move-in.